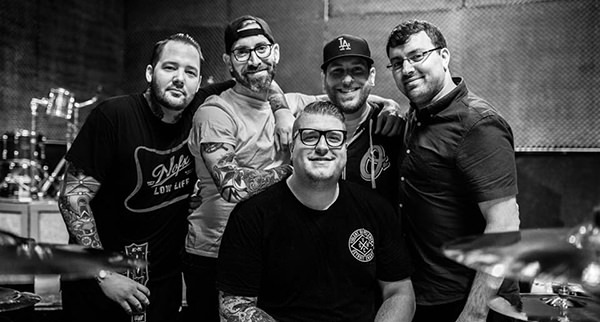 "This is The Ghost Inside 2018. We weren't always sure we would make it here. All along we've said 'let's just get in a room with instruments and see what happens'. Andrew gave us 4 clicks and we sailed off into Between the Lines. Over the next few hours we hacked our way through a dozen or so songs, one at a time. Everything is different. Fingers and feet and throats that have played these songs a thousand times don't operate on autopilot anymore. But there was something special, something beautiful, in doing the thing we love by sheer force of will. Spending a week together as bandmates answered the question that has been on all of our minds - yes there is a future for TGI. We still aren't sure exactly what it looks like. It might be one show, it might be a few shows. It could be a new song or a whole new record. Our journey into that future is just beginning, and we will bring everyone that is interested along with us. Every Monday, one band member will take over all of our social media to give you insight and updates on their personal progress, as well as glimpses behind the scenes of what we are doing as The Ghost Inside as this new chapter unfolds. We know that this is a new normal but hey, the same old thing gets boring right? Thanks for proving that you are the Tried and True."